Burga cites Brown’s firm stances on trade, freedoms for working people as impetus for unanimous vote. The executive board of the Ohio AFL-CIO announced today that it has unanimously voted to endorse Senator Sherrod Brown as he seeks re-election in 2018. 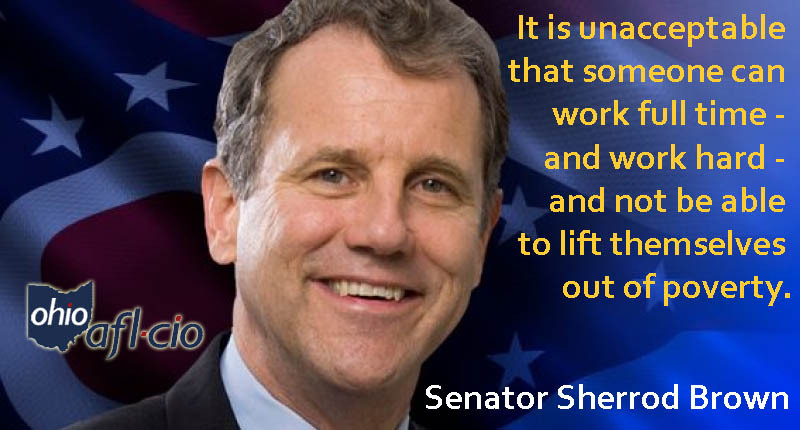 “Sherrod Brown has always been on the right side of issues that matter most to working people in Ohio,” said Ohio AFL-CIO President Tim Burga. “Sherrod has consistently opposed bad trade deals that he knew would hurt our economy and cost us jobs,” he said. “Now that NAFTA is being renegotiated, we need him to stand up for the workers in Ohio that have everything at stake—and we know that he will be there for us,” said Burga. “Sherrod has never been afraid to stand up to corporate interests that seek to take away our freedom to join together and negotiate for a fair return on our work,” said Burga. “He is co-sponsoring a bill in the Senate that puts a ban on so called right to work laws which lower wages and rig the rules to take away our freedom to join together in union,” he said. “This is exactly what working people deserve in a senator, and with Sherrod Brown, we get that and more,” Burga said. “This was not a difficult decision to make, but it is an important one nonetheless,” said Burga. “Working Ohioans need Sherrod Brown in the Senate because he is an independent voice that we can always rely on to speak out for our families,” he said. The Ohio AFL-CIO represents over 500,000 union workers from 40 affiliated international unions in the public, private and federal sectors of employment.